Emily T. Houghton married Samuel Tilton at Conway, Franklin Co., MA, USA. Sabra Houghton and Albin Page Howe declared their intentions of marriage on Jan 14, 1827 Berlin, Worcester Co., MA, USA. Sabra Houghton married Albin Page Howe in Jun 10, 1827 at Berlin, Worcester Co., MA, USA, 6,10, 1727 given. Lucy Houghton married Oliver Fosgate in Apr 10, 1832 at Berlin, Worcester Co., MA, USA, MLM: 1822; Berlin MA Hx: Mar 1832. Jonas Houghton married Fanny Martyn Eagar in Sep 3, 1835 at Northborough, MA, USA, w/1. Jonas Houghton married Mary Jane Dunning in Apr 21, 1842 at Van Buren Co., IA, USA, w/2. Silas Houghton and Susan B. Cofran declared their intentions of marriage on Dec 14, 1833 Berlin, Worcester Co., MA, USA. Silas Houghton married Susan B. Cofran in 1834. Death Mar 20, 1851 Berlin, Worcester Co., MA, USA, a. 39 y. 2 m.
Levi Houghton and Patience Ford Harlow declared their intentions of marriage on Sep 27, 1835 Berlin, Worcester Co., MA, USA. Levi Houghton married Patience Ford Harlow in Oct, 1835 at Shrewsbury, Worcester Co., MA, USA. Levi Houghton and Lucy Ann Conant declared their intentions of marriage on Nov 7, 1848 Lowell, Middlesex Co., MA, USA. Levi Houghton and Lucy Ann Conant declared their intentions of marriage on Nov 12, 1848 Berlin, Worcester Co., MA, USA. 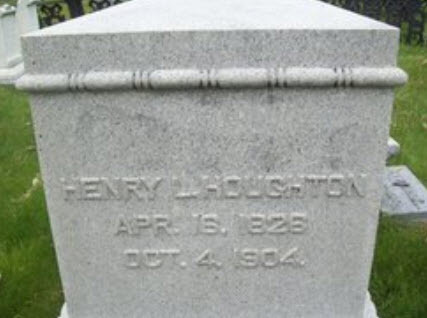 Levi Houghton married Lucy Ann Conant in Jan 1, 1849 at Lancaster, Worcester Co., MA, USA, Levi, 36; Lucy, 32. Amory Johnson Houghton married Jemima America Greswell in May 16, 1839 at Van Buren Co., IA, USA. Jonathan Houghton married Elizabeth (?) in circa 1852 mar 48 years in 1900 census. Ruth Weatherbee Howe and Merrick Houghton declared their intentions of marriage on Aug 4, 1820 Berlin, Worcester Co., MA, USA. Ruth Weatherbee Howe married Merrick Houghton, son of Silas Houghton and Lucy Farnsworth, in Aug 27, 1820. Samuel Tilton married Emily T. Houghton, daughter of Silas Houghton and Lucy Farnsworth, at Conway, Franklin Co., MA, USA. Albin Page Howe and Sabra Houghton declared their intentions of marriage on Jan 14, 1827 Berlin, Worcester Co., MA, USA. Albin Page Howe married Sabra Houghton, daughter of Silas Houghton and Lucy Farnsworth, in Jun 10, 1827 at Berlin, Worcester Co., MA, USA, 6,10, 1727 given. Oliver Fosgate married Lucy Houghton, daughter of Silas Houghton and Lucy Farnsworth, in Apr 10, 1832 at Berlin, Worcester Co., MA, USA, MLM: 1822; Berlin MA Hx: Mar 1832. Fanny Martyn Eagar married Jonas Houghton, son of Silas Houghton and Lucy Farnsworth, in Sep 3, 1835 at Northborough, MA, USA, w/1. Mary Jane Dunning married Jonas Houghton, son of Silas Houghton and Lucy Farnsworth, in Apr 21, 1842 at Van Buren Co., IA, USA, w/2. Susan B. Cofran and Silas Houghton declared their intentions of marriage on Dec 14, 1833 Berlin, Worcester Co., MA, USA. Susan B. Cofran married Silas Houghton, son of Silas Houghton and Lucy Farnsworth, in 1834. Patience Ford Harlow and Levi Houghton declared their intentions of marriage on Sep 27, 1835 Berlin, Worcester Co., MA, USA. Patience Ford Harlow married Levi Houghton, son of Silas Houghton and Lucy Farnsworth, in Oct, 1835 at Shrewsbury, Worcester Co., MA, USA. Jemima America Greswell married Amory Johnson Houghton, son of Silas Houghton and Lucy Farnsworth, in May 16, 1839 at Van Buren Co., IA, USA. Clarissa Ann Houghton married Otis Kimball in May 3, 1843 at Bath, Sagadahoc Co., ME, USA. Levi Warren Houghton married Arzilla Blethen in Dec 28, 1843 at Brunswick, Cumberland Co., ME, USA, MLM: Dec. 26. 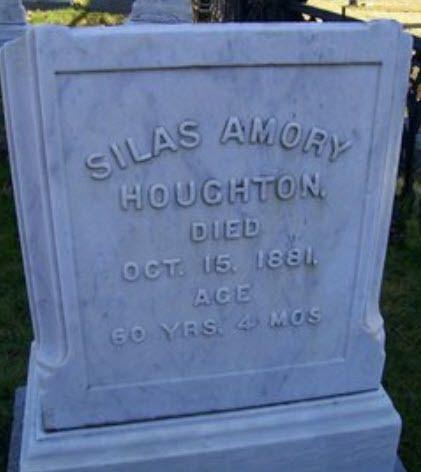 Silas Amory Houghton married Lucy Anne Jewell in Nov 22, 1843. 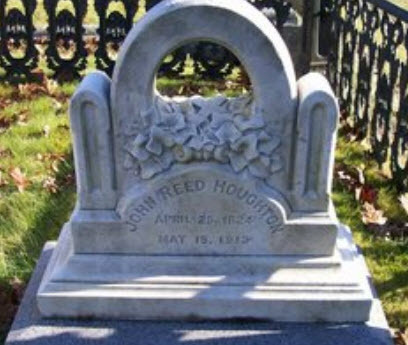 John Reed Houghton married Emma Patten McClellan in Nov 25, 1858 at Bath, Sagadahoc Co., ME, USA. Charlotte Reed Houghton married Cornelius Irving Meeker in Aug 21, 1850. Otis Kimball married Clarissa Ann Houghton, daughter of Levi Houghton and Charlotte Reed, in May 3, 1843 at Bath, Sagadahoc Co., ME, USA. Arzilla Blethen married Levi Warren Houghton, son of Levi Houghton and Charlotte Reed, in Dec 28, 1843 at Brunswick, Cumberland Co., ME, USA, MLM: Dec. 26. Lucy Anne Jewell married Silas Amory Houghton, son of Levi Houghton and Charlotte Reed, in Nov 22, 1843.